Ever wished you could walk into a restaurant and request a dish that isn’t on the menu? The site CookItForUs, which was featured on our list of 10 Chicago startups you need to know about, gives you something of a virtual opportunity to do just that. So how does it work? When you sign up for a free account, you can be both a ‘craver’ or a ‘maker.’ Cravers collect recipes from all over the Web that they’re, well, craving, and makers can offer to make them. 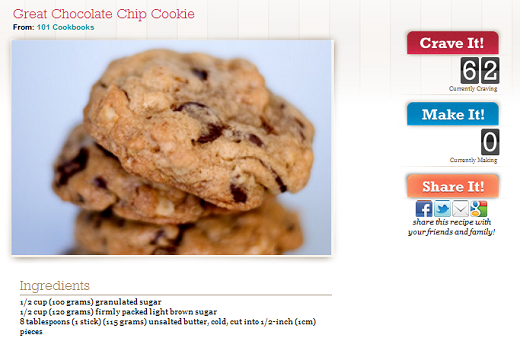 The site also provides a handy little bookmarklet which makes it easy to save recipes to the site on the fly. 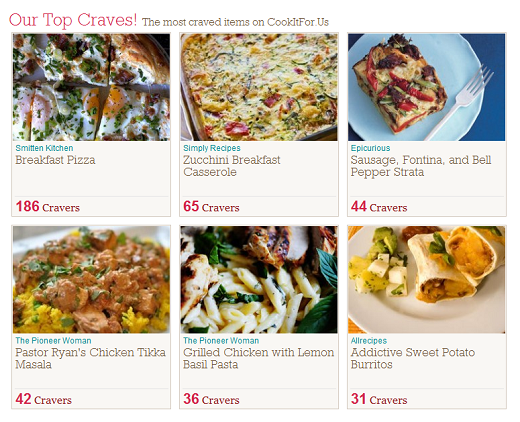 If you spot a recipe that someone has already posted on the site, you can ‘crave it’ as well. Makers can then offer to cook the dish once there are enough people in their area requesting the dish. CookItForUs brings the concept of group buying to cooking since there has to be a certain number of cravers in a certain area before the person can make the dish. Under each recipe, you can see the ingredients, how many people are craving it, and how many are making it, if any. You can also ‘Request a maker’ – which basically involves sending an email to CookItForUs letting them know what your order is, how much you’re willing to pay, and they’ll notify you once they have a maker. CookItForUs also has something of a social network element to it, allowing you to add other users as friends on the site, and of course you’re encouraged to share the recipes you’re craving on social networks, to get more people putting in an order. The site has got one tall order – it has to find enough people craving the dish and find someone willing to make it, while users are left to figure out some sort of delivery system. The orders are, however, pre-paid using an online payment system powered by PayPal. If existing catering businesses or restaurants come into the equation, this is where the site can shine, since they can really put CookItForUs to good use. For restaurant owners, the site can easily become a great way for them to expand their menu based on customer requests, and for existing or new caterers, it becomes a great way to drum up business. Right now the website seems to be a whole lot of cravers and not too many makers. There are a ton of mouth-watering recipes listed on the site. As is, it becomes a great source for curated recipes that you can simply use as inspiration, or even make it yourself. We’re hoping, however, that more makers, restaurants and caterers get on board, and the site can be used exactly as it was meant to be.